Ariana Grande has announced the Sweetener World Tour in support of her latest album Sweetener, released in August. 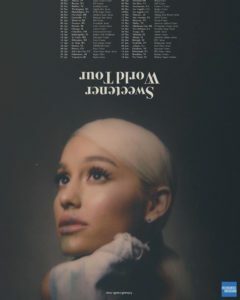 The tour will begin on March 18th in Albany, New York at Times Union Center and wrap up on June 18th in New York City at Madison Square Garden. The pre-sale for American Express cardholders will run from November 1’st until November 3rd. Grande had previously expressed that she wanted to take time away from music due to her breakup with short lived boyfriend Pete Davidson and the death of ex boyfriend Mac Miller who died earlier this year. All dates can be found here.